Will this baby eat leeks soup? A review of Bringing up Bébé by Pamela Druckermana.k.a. Why you’ll never catch a Parisian mother with a Ziploc bag of Cheerios…. I should start by saying I’m a total francophile. I pretty much adore the language, the land, the people, and the snobbish culture that has endured and persisted despite global sophistication killers like le Big Mac and Paris Hilton. More than anything, I love the way they dress their babies… those knits! So it’s no surprise that I’m a little taken with this book that spills the secrets of french-style parenting. A book that, incidentally, might help us all bring up better behaved, less bratty babies — and therefore preserve our sanity. Birthday parties where 5-year-olds sit patiently at tables waiting for their slices of cake. Babies who sleep through the night at just 2 or 3 months old. Kids that act more grown up: The idea that kids don’t need you to applaud and entertain them at every second. Kids can learn autonomy, and will be more self-sufficient if they understand that while they ARE the centre of your universe, their universe is not the only one. Mommy needs mommy time. Civilized meal time: Eating is about flavor, taste, and the experience — not just food in, food out. French babies have a snack time once per day (4:00) and eat better because they aren’t noshing from morning to night. Do I plan to be a french-type mom? Uhh.. yeah. There is nothing so far that turns me off the idea, I’ll say that much! So probably yes, in many ways, I will strive to have a food-appreciating, parent-respecting, sophisticated child. Yes indeed. Yes please. In other news…. Wish me luck! We may have a bébé ourselves by the time I post next. Somehow I think I’ll probably sneak one more in under the wire though. Hard to believe the pregnancy journey is nearly complete and the parenting one is just beginning. My first three months seems like a lifetime ago…. Time is about to start flying, isn’t it?? 9 months pregnant belly with 9 days left…. What’s your parenting spirit animal? I’ve never related to bears before. Squirrel, sure. Industrious beaver maybe. Fast wild cat, definitely at times. 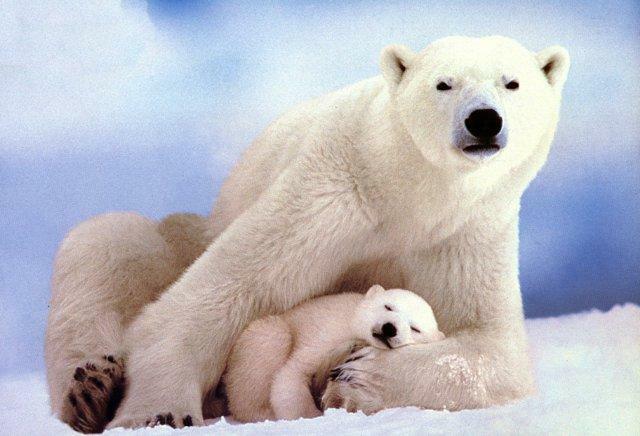 But recently it’s the polar bear that keeps creeping up in my mind; that playful tumbler, with her solemn expression of dutiful living, and that commitment to motherhood through anything – just 100% pure protection, nurturing, teaching, and cozy cuddling…. love ’em! I even love what I’ve been affectionately referring to as my polar bear layer. Before getting pregnant I weighed about 107 pounds. Now, I weigh 150! 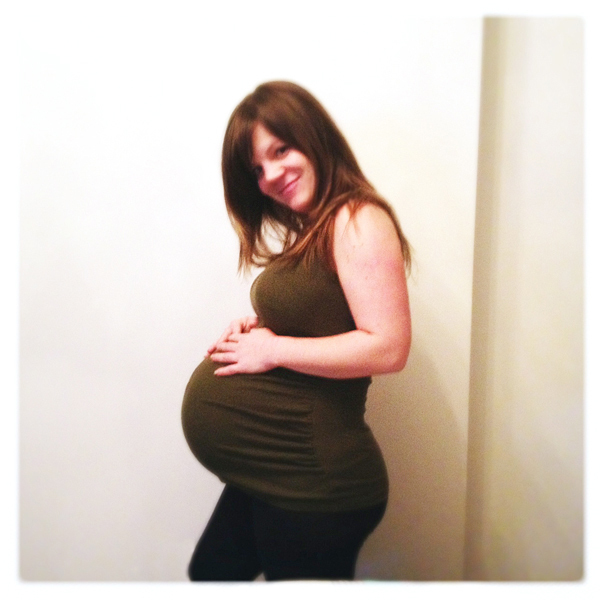 Ok, it’s true – I’m giving birth in less than 3 weeks (hear that baby? Not a day later! ok?!) so I’m about at my maximum weight gain but the crazy thing is – I don’t feel fat. I don’t feel like I’ve gained a huge amount of weight other than “the bump” which is taking up a large portion of my smallish body right now, and the layer on my legs and arms that makes them just a bit more thick and taut then they were before. Could be water, could be fat stores – but it’s not wiggly jiggly. And speaking of which. Guess how much weight polar bears gain in pregnancy? Wait for it…… yeah….. around 400 pounds. I’ve just hit term today (37 weeks) and for the last few days I’ve had this tremendous urge to eat, like biologically my body knows that this is a crucial time for foraging because my baby bear’s coming soon and I will need the stored resources to feed her. I think it’s made me a bit more relaxed about the weight gain, and even the pressure to be a perfect mom. Polar bears are instinctual providers, fierce protectors, and also maintain that good-natured ability to roll around in the snow with their little one. Why overthink parenting when the most important things are really quite simple. Eat, sleep, play. Anyway, here’s a list of some other pregnancy spirit animals (or totem animals) and their qualities. Which one are you?